MANHATTAN — It was a shell game. 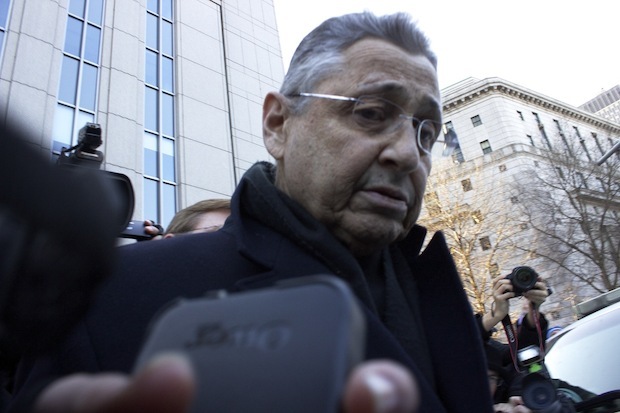 Longtime state Assembly Speaker Sheldon Silver was arrested Thursday for taking "millions of dollars in bribes and kickbacks" that he masked as legitimate income from practicing law and tried to block corruption investigators from uncovering, federal prosecutors said. 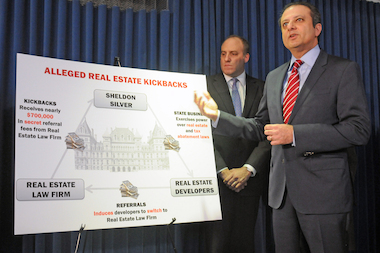 A stinging 35-page federal complaint said Silver pocketed the loot over more than a decade and that his claims that he had legitimate outside income from personal injury firm Weitz & Luxenberg was "materially false and misleading." Sources said that the investigation stemmed from information provided by other state legislators who were under investigation as well as cooperating witnesses. A grand jury was convened in June 2013, a month before Gov. Andrew Cuomo empanelled the Moreland Commission to investigate Albany corruption. Cuomo subsequently disbanded the commission after negotiations that involved Silver and other Assembly members, even as subpoenas against them were pending. Silver, who represents the Lower East Side and Downtown, and has been the speaker for more than 20 years, was taken into custody about 8 a.m. and was transferred to federal court about two hours later. Silver appeared before Federal Magistrate Judge Frank Maas and was released on $200,000 bail. Wearing a navy blue pinstripe suit and red tie, Silver mostly stared straight ahead during the 20 minute hearing with the ocassional glance downward. He faces 20 years on each of five counts of fraud, conspiracy and other charges. Silver whispered with his lawyers during a brief silence and spoke only one word, "yes," when asked by Maas if he understood the terms of his bail agreement. "I'm confident that after a full hearing and due process I will be vindicated of these charges," Silver, 70, said outside the courtroom. Since roughly 2000, Silver received approximately $6 million in kickbacks and bribes from two law firms — Weitz & Luxenberg and, according to sources, Goldberg & Iryami — in a "secret and corrupt scheme" above and beyond his $121,000 official salary, prosecutors said. In one example, prosecutors said Silver received $700,000 in bribes and kickbacks by pushing a pair of developers, including one with a $1 billion luxury portfolio, to use Goldberg & Iryami without them knowing them he was getting a cut. Both developers received state subsidies and tax breaks. He also received $5.3 million from Weitz & Luxenberg, including $1.4 million salary for a no-show job and $3.9 million in referral fees for asbestos cases that he did not work on, scheming with prominent Manhattan doctor – who sources identified as Robert Taub — to push patients to the firm in exchange for research money, court documents say. The US Attorney's office said Silver did no asbestos or real estate work in exchange for the cash. Then he tried to block the Moreland Commission, which he decried as a "fishing expedition to intimidate legislators" from researching his outside income by refusing to cooperate and pushing the Assembly to block subpoenas at taxpayer expense. The documents paint a picture in which Silver used his position in state government to line his pockets using the cover of working as a personal injury lawyer who worked "of counsel" with Weitz & Luxenberg. Publicly, he represented himself as a lawyer who represented "plain, ordinary simple people" in personal injury matters and did not have any cases pertaining to state business, but prosecutors said the work was nothing more than a sham. Starting in 2002, Silver did not make any appearances in cases that he said he was involved with at the state and federal level, the documents said. Also, the majority of the more than 100 clients he referred to the Weitz & Luxenberg for asbestos litigation, not personal injury. Authorities also say Weitz & Luxenberg hired Silver in 2002 without really knowing him and despite the fact that he had no experience litigating mesothelioma cases. US Attorney Preet Bharara outlines the corruption charges against New York State Assembly Speaker Sheldon Silver during a press conference at the federal prosecutor&#39;s officers, Jan. 22, 2015. In the alleged healthcare scheme, prosecutors say Silver pushed the Manhattan doctor, who he knew through a mutual friend, to send patients to Weitz & Luxenberg in exchange for research grants. 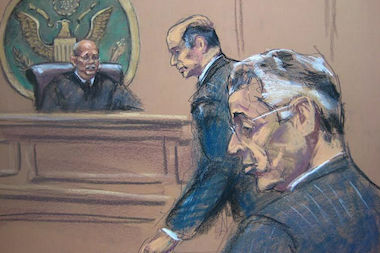 Based on interviews with 10 clients or their families, none had contacted Silver or remember him working on the cases. Starting in 2005, he pushed the state to distribute $500,000 in grants, with no oversight, to the doctor. He also never explained what the money was being used for. Authorities say Silver shifted state healthcare funding to a pool that he directly controlled so that he was able to distribute the cash "at his discretion, with no public disclosure of the disbursements," the documents say. That pool of cash was abolished in 2007. In a form for the first grant, Silver said that the funding was needed in part "to study mesothelioma as the result of the release of asbestos into the air on September 11, 2001." Even when the doctor began working with another law firm in 2010, he still referred cases to Silver after the speaker came to his office to ask what was going on. With the exception of "one or two isolated referrals," the doctor was the only source of his asbestos-related referrals, the court documents say. Silver also steered $25,000 to a not-for-profit where the doctor's family member served on the board, the documents alleged. And in 2012, he steered another of the doctor's family members to a job at a non-profit that received millions in member items from the speaker. In the alleged real estate scheme, Silver is accused of taking fees from a real estate law firm, which sources identified as the Midtown-based Goldberg and Iryami, in order to help large developers lower their taxes. The firm declined to comment and directed calls to their attorney, Michael Ross. According to the documents, the firm has just two lawyers, including his former counsel in the Assembly, and represents mostly small clients, with the exception of two large developers referred by Silver. One of the developers, which owns luxury rental properties valued at more than $1 billion, receives state subsidies and tax abatements and has properties in Silver's district. Prosecutors allege that Silver steered their business to the real estate firm without the developer knowing that he was getting a 25 percent cut. When it came to light in 2012, the developer signed an agreement that part of its fees were going to Silver. He also steered a second developer, which owns properties in the district to the firm in 2005, without telling them that he was getting a 15 percent cut, the documents said. A rep was not immediately available for comment. “Weitz & Luxenberg was not involved in any of the wrongdoing the Government alleges, and the Firm, which has fully cooperated with the Government in this matter, was not aware of any improprieties whatsoever," the firm said in a statement. "As referred to in the Complaint, the Firm did not know that any referrals brought to the Firm by Mr. Silver related in any way to the alleged actions on his part to benefit the referring doctor”. Taub did not immediately respond to a request for comment. Trevor Kapp, Ben Fractenberg and Lisha Arino contributed reporting.